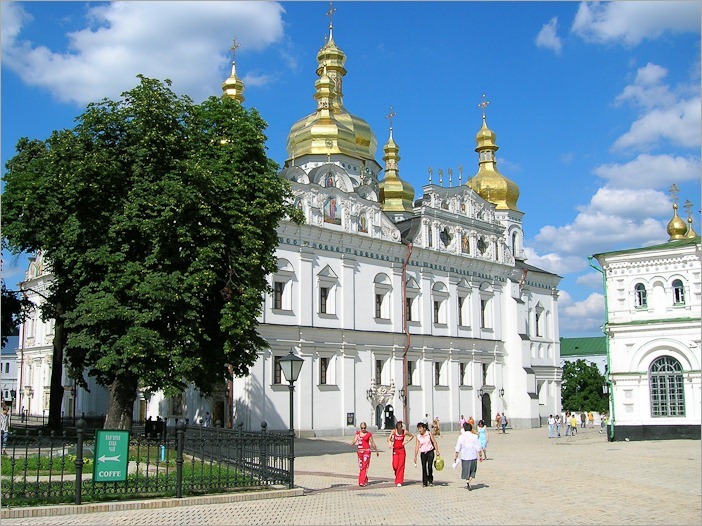 In 1106 A.D. began the construction of the Cave Monastery in pagan Kyiv, at the time part of the Russian Empire. 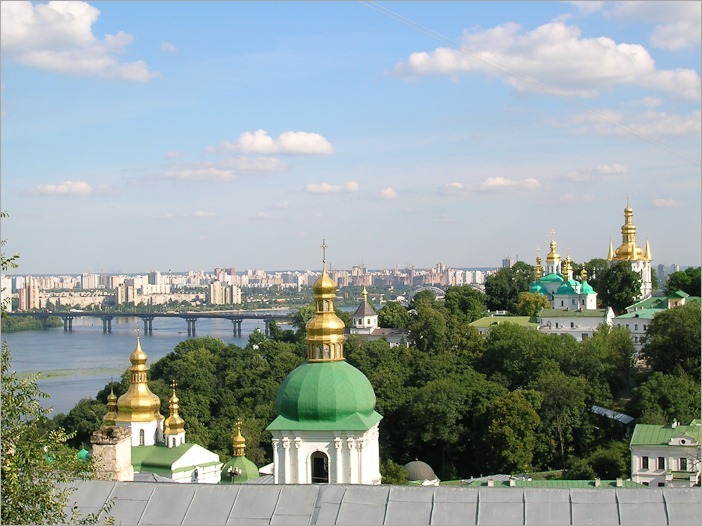 On the hills boarding the Dnepr river, or more exactly IN the hills boarding the Dnepr were built the first places of worship. Careful not to hurt anybody’s feelings with Christianity, the church held close ties with the far older pagan beliefs. Among the symbols of Christianity, like the cross and the saints, you can also find the sun and the moon and other, even darker, symbols. Even here in Winnipeg and in several Orthodox churches here in Canada you can find these symbols. Just look closely. So the monastery was quietly built, but slowly it began to grow bigger and more visible. Christianity began to win in influence and the pagan beliefs were more and more abandoned and forgotten. Today, it stretches out over several acres of land, all cultivated or built upon. 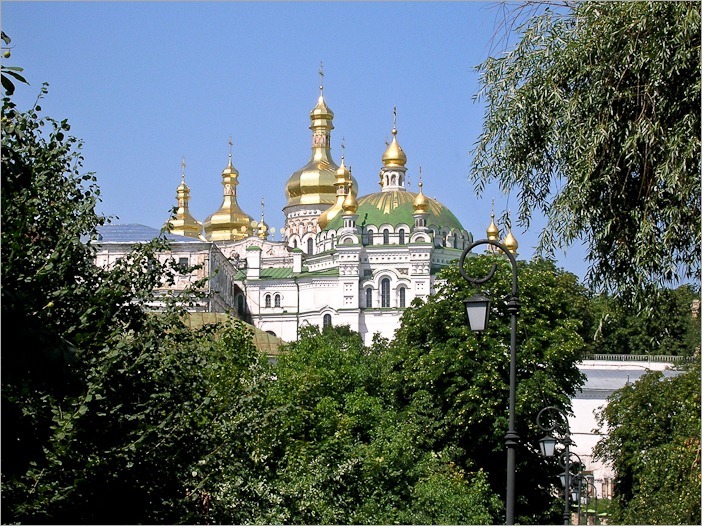 The golden domes blink in the sun and are visible from far away. The biggest visible element in the complex is the central Belfry, dating from 1731. Obviously the pagan beliefs were no longer a threat to the life of the monastery at that time and more luxurious structures could be built. To get an idea of the size of the different buildings, take a look at these pictures. This is a place of great tourism. Tourists come in from all over the world to see the complex inside and out. Photographing inside may pose a problem here and there; nobody seems to know the rules pertaining to photography. The best thing to do is start taking pictures until someone asks you to stop. Asking beforehand will most likely cost you a pretty penny or will result in a refusal. In any case try not to use a flash, that is a quick method for the way out. Even the older churches, because there are many chapels and churches on the premises, can be visited and you can still feel the old atmosphere of worship inside. 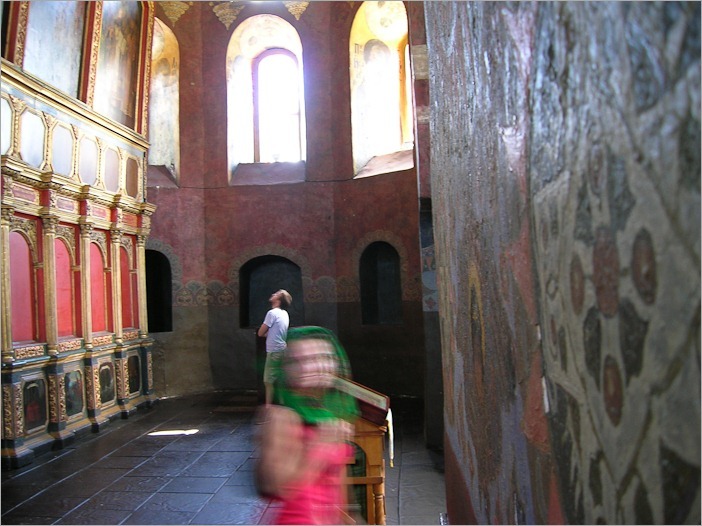 The walls are covered with paintings, some beautifully restored, others still waiting. The floors are original, and you can feel and see the polished old age. For me, who am not the most fervent church-goer, it came as a very interesting feeling to walk on these old floors. 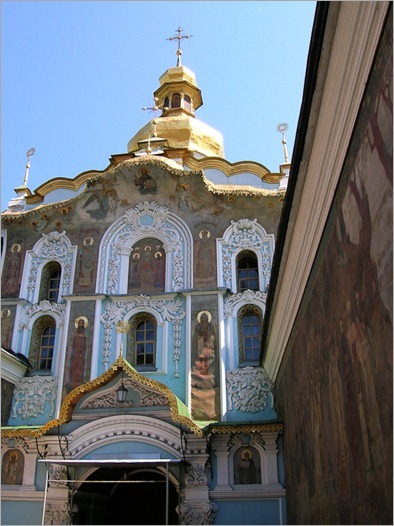 The latest additions to the Lavra date from 1897. All buildings are still in use today. Albeit that some have changed their orientation to a more business oriented function. 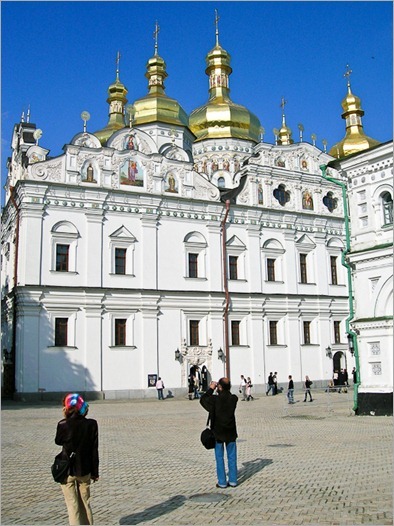 In most pictures you can observe the women having their head covered, rule in the Orthodox church. You are also asked to be dressed properly, having uncovered shoulders is not appreciated, at least not inside. So why my first question about becoming a memory? Today, the hard Ukrainian winter is not even at an end. The first winter with so much snow since at least 25 years. The Lavra has undoubtedly seen worse and more and longer. Except that today, maintenance and restoration are not on the menu. Makeshift repairs are the result and sooner or later part of the buildings will collapse. 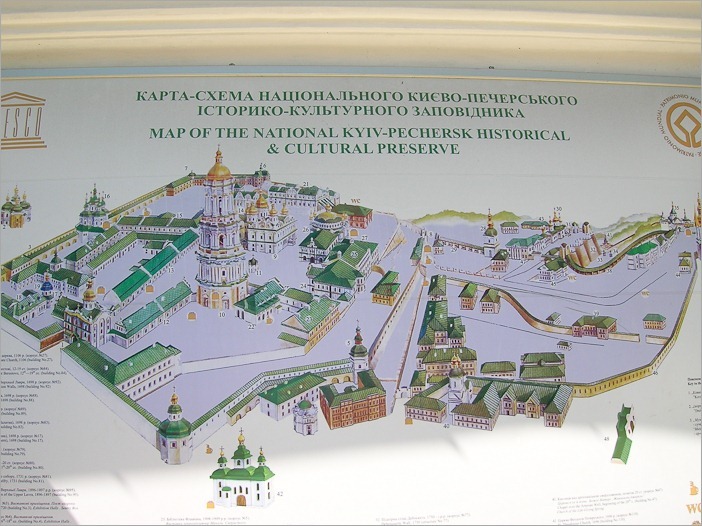 Many of the caves which were the heart and soul of the Lavra are now inundated and some of them beyond repair. Some people may not care. But why let history become a memory ? 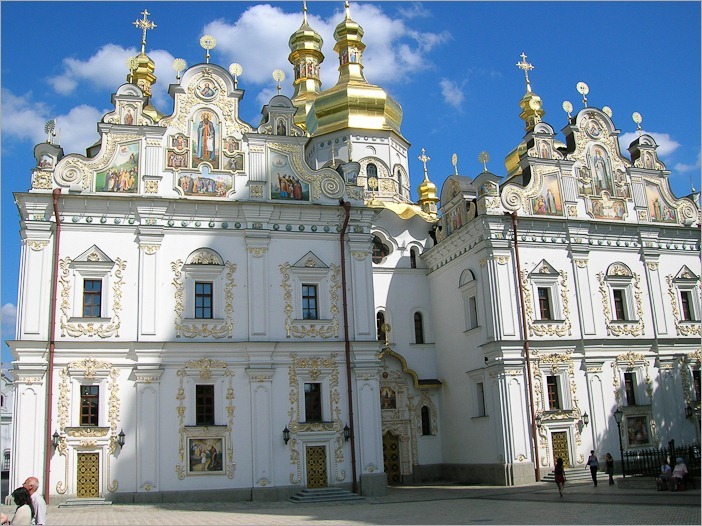 Perhaps soon the Church or the Ukrainian state will find the means to repair the buildings. Hopefully before it is too late.